prevention industry? How did you get started with DIGGER and how long have you been here? 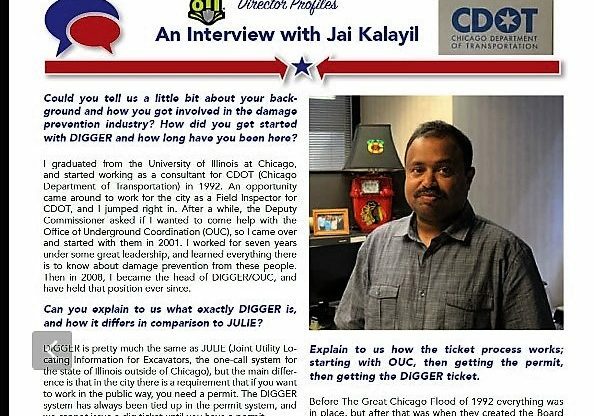 I graduated from the University of Illinois at Chicago, and started working as a consultant for CDOT (Chicago Department of Transportation) in 1992. An opportunity came around to work for the city as a Field Inspector for CDOT, and I jumped right in. After a while, the Deputy Commissioner asked if I wanted to come help with the Office of Underground Coordination (OUC), so I came over and started with them in 2001. I worked for seven years under some great leadership, and learned everything there is to know about damage prevention from these people. Then in 2008, I became the head of DIGGER/OUC, and have held that position ever since. Can you explain to us what exactly DIGGER is, and how it differs in comparison to JULIE? Check out more here in the current preview version of The American Locator.